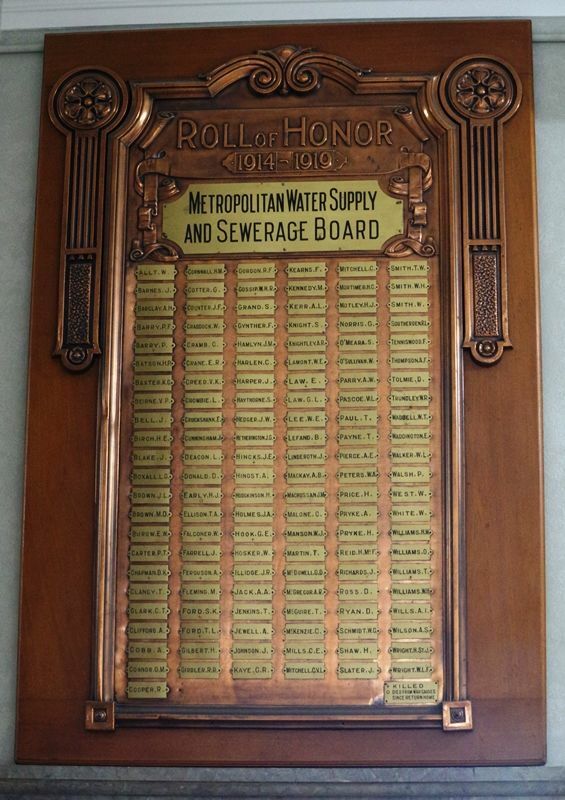 The honour roll commemorates employees of the Metropolitan Water and Sewerage Board who served in World War One. An interesting ceremony look place at the offices of the Metropolitan Water Supply and Sewerage Board yesterday when, in the presence of a large gathering, of employees, Mr. E. J. T. Manchester unveiled the honour board erected under supervision and direction of the Soldiers' and Sailors' committee. Mr. Manchester said that he looked back with respect on the members of the staff who had enlisted. Many of them would never answer the roll call again. The members of the staff who enlisted did their share for the cause of liberty and justice, and wherever they were they acquitted themselves nobly and well. Dr. A. C. Halford said that in erecting the honour board they had done all that was left to do for the Board's soldier employees. He congratulated the Soldiers' and Sailors' committee. Mr. T. Wilson, M.L.A.. in adding his tribute to the men who went abroad, said that some had not returned, and he sympathised with their relatives. Altogether 133 men had enlisted, of whom 12 had been killed and one wounded. Every employee had been treated well before he went and after he came back. Mr. Manchester then unveiled the board. "As a constant memory, and in visible appreciation," and Bandmaster Simpson sounded the "Last Post." The honour board is 6ft. long, and 3ft. broad. and is surmounted by a handsome pattern of beaten copper plate. Each name is engraved on a brass plate which is attached to the board. The Brisbane Courier (Qld), 22 February 1922.